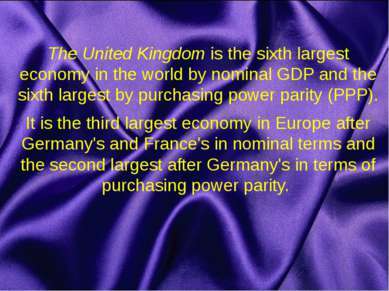 The United Kingdom is the sixth largest economy in the world by nominal GDP and the sixth largest by purchasing power parity (PPP). It is the third largest economy in Europe after Germany's and France's in nominal terms and the second largest after Germany's in terms of purchasing power parity. The United Kingdom is the second largest financial economy in the World, second only to the United States and is home to many of the World's largest banks and companies. 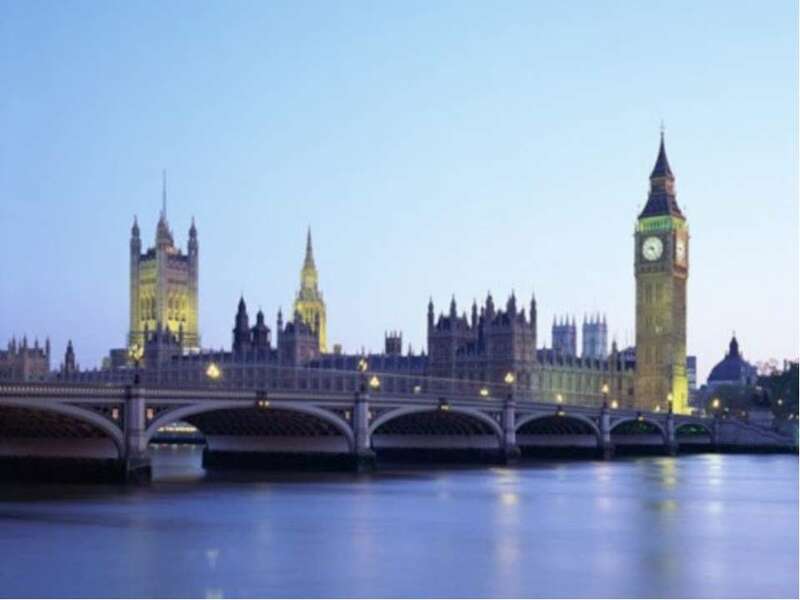 London, the country's capital is the largest financial centre in the World, has the largest city GDP in Europe and is home to over 100 of Europe's 500 largest corporations with such corporations as HSBC and BP. 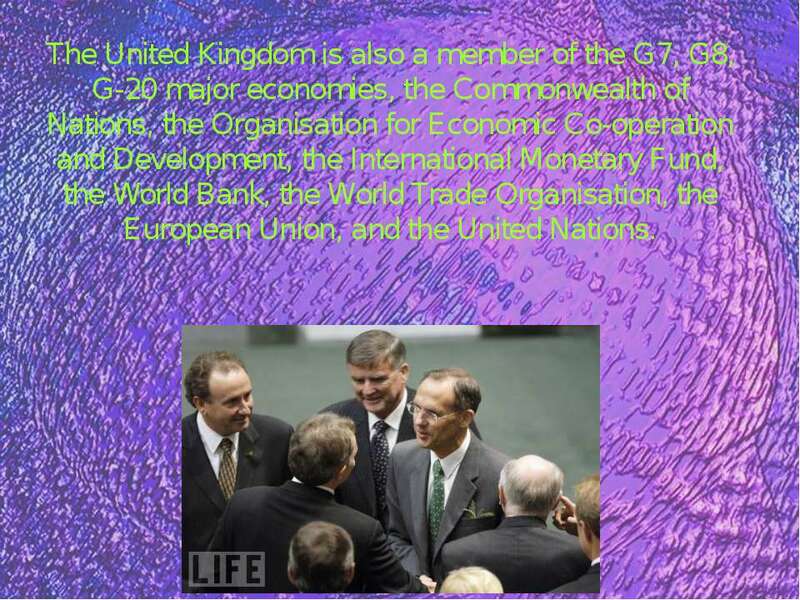 The United Kingdom is also a member of the G7, G8, G-20 major economies, the Commonwealth of Nations, the Organisation for Economic Co-operation and Development, the International Monetary Fund, the World Bank, the World Trade Organisation, the European Union, and the United Nations. 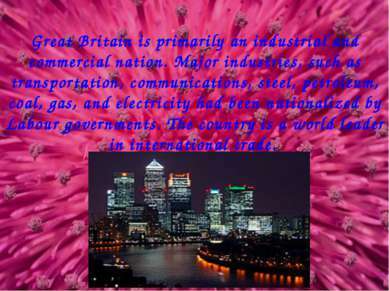 Great Britain is primarily an industrial and commercial nation. 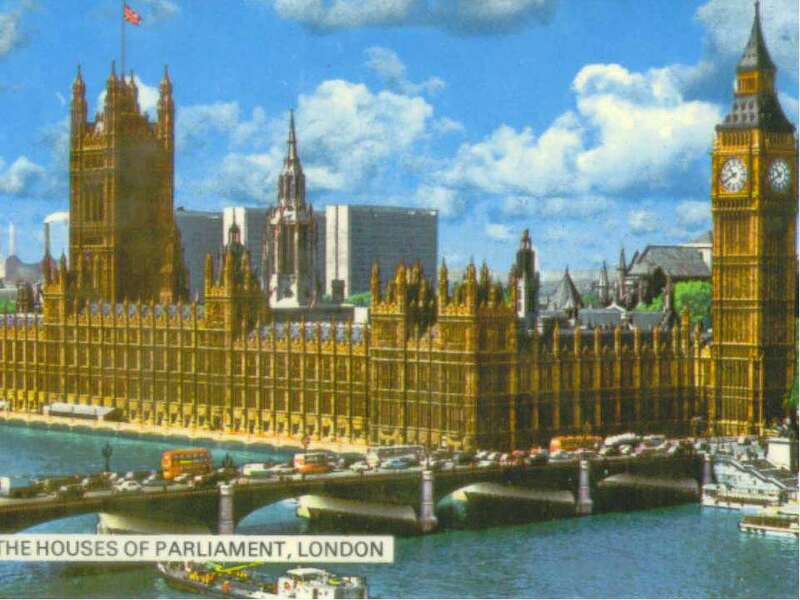 Major industries, such as transportation, communications, steel, petroleum, coal, gas, and electricity had been nationalized by Labour governments. 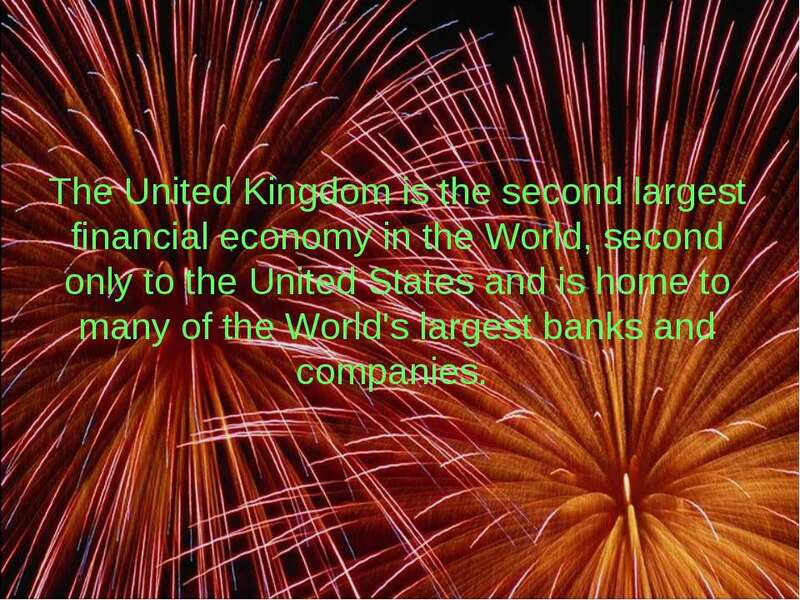 The country is a world leader in international trade. Agriculture Agriculture in Great Britain is intensive and highly mechanized. 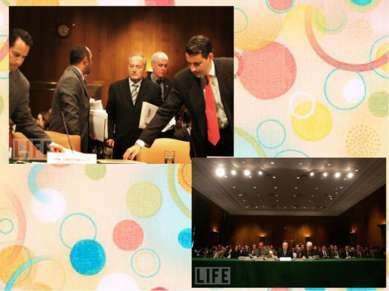 Income from livestock and dairy products is about three times that from crops. Horticultural products are also important, especially in southern England. 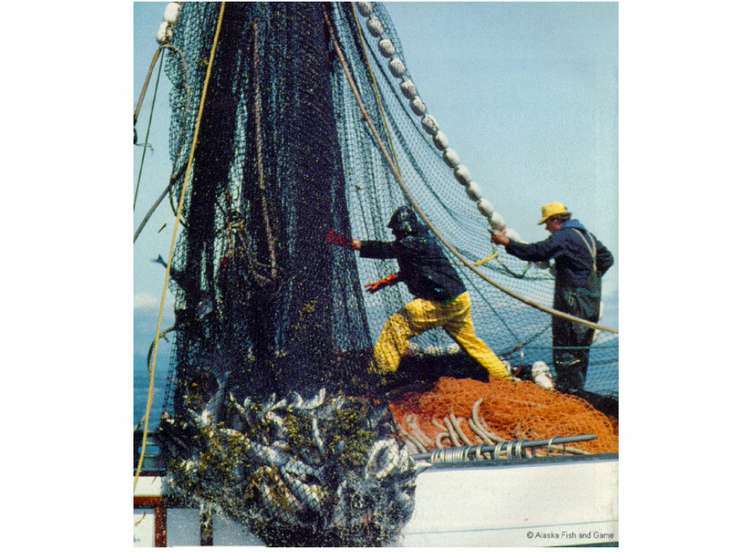 The most important crops were wheat (14.1 million metric tons), potatoes (7.8 million), barley (7.4 million), sugar beets (8.5 million), and oats (504,000). A variety of fruits and vegetables is also grown. 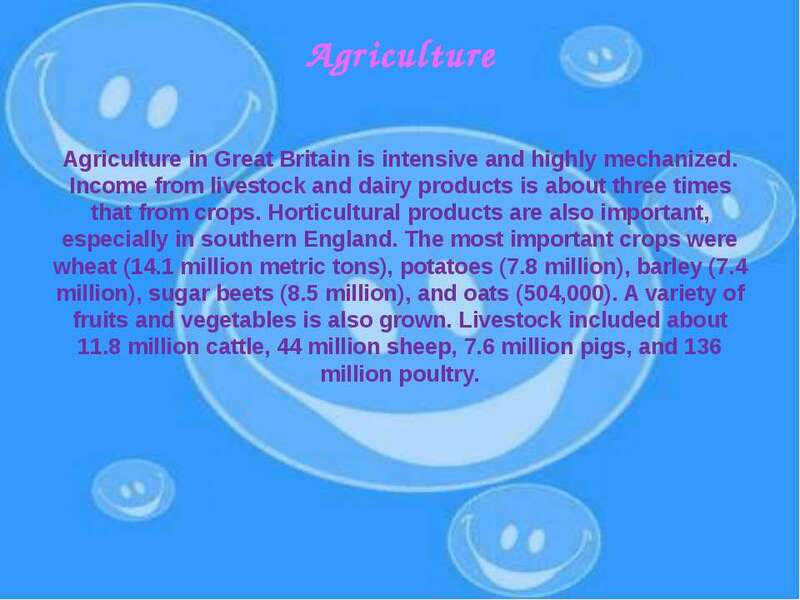 Livestock included about 11.8 million cattle, 44 million sheep, 7.6 million pigs, and 136 million poultry. Forestry and Fishing Of the approximately 2.2 million hectares (about 5.4 million acres) of woodlands in Great Britain, about 40 percent are in England, 49 percent in Scotland, and 11 percent in Wales. The most common trees are oak, beech, ash, and elm. 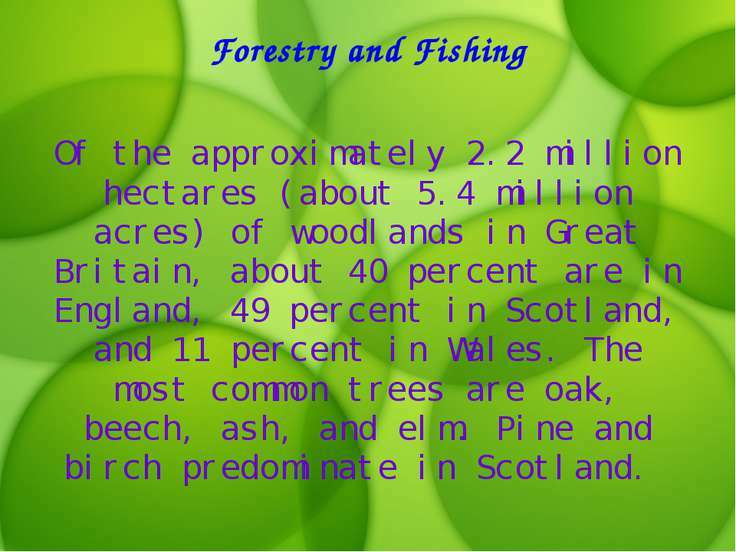 Pine and birch predominate in Scotland. The deep-sea fishing industry has declined since the 1960s it remains most important to the economy of Scotland and is a major source of employment in certain fishing ports. Marine fishes harvested include Atlantic mackerel, Atlantic herring, cod, haddock, European plaice (various flatfishes, including flounder), Atlantic salmon, whiting, common cockle, and Norway lobster. 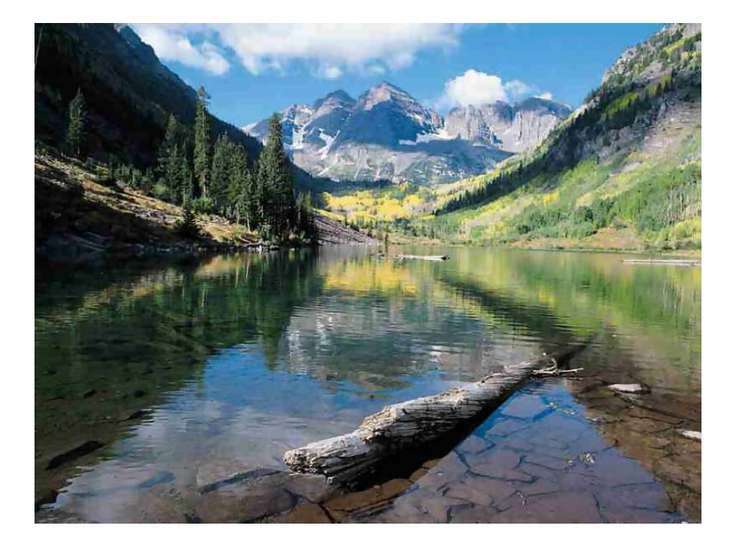 The principal freshwater fish caught is rainbow trout. 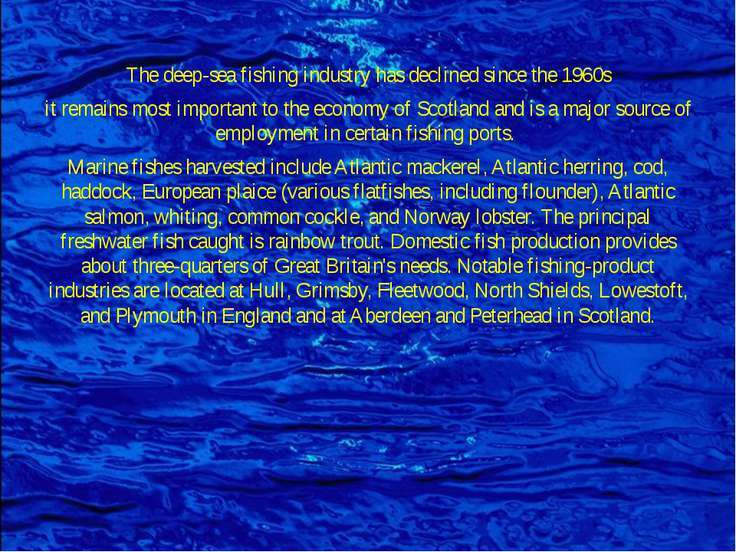 Domestic fish production provides about three-quarters of Great Britain's needs. Notable fishing-product industries are located at Hull, Grimsby, Fleetwood, North Shields, Lowestoft, and Plymouth in England and at Aberdeen and Peterhead in Scotland. Manufacturing Manufacturing is an important sector of the modern British economy and there is a considerable amount of published research on the subject of the factors affecting its growth and performance. 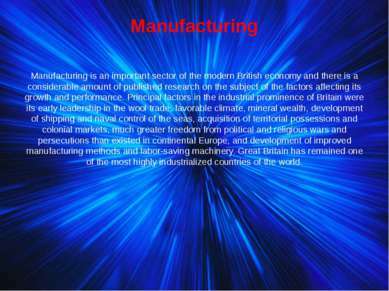 Principal factors in the industrial prominence of Britain were its early leadership in the wool trade, favorable climate, mineral wealth, development of shipping and naval control of the seas, acquisition of territorial possessions and colonial markets, much greater freedom from political and religious wars and persecutions than existed in continental Europe, and development of improved manufacturing methods and labor-saving machinery. 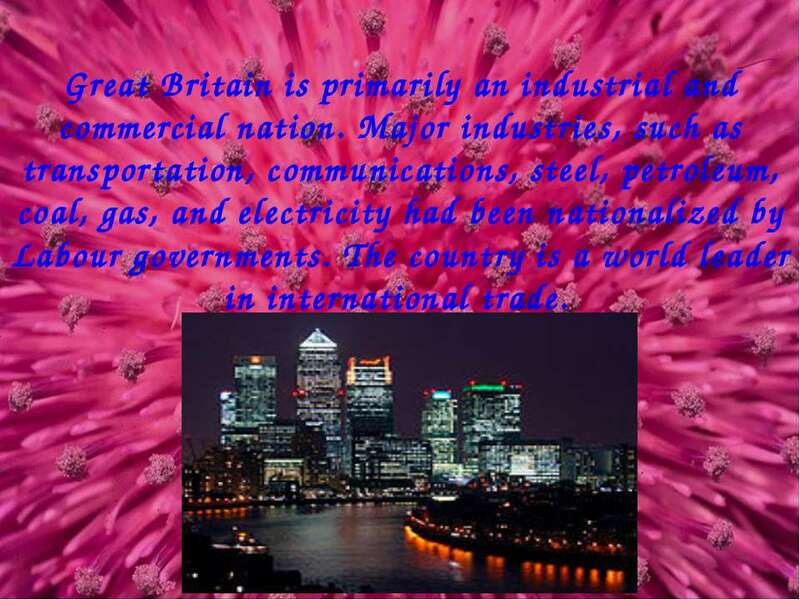 Great Britain has remained one of the most highly industrialized countries of the world. Mining The UK has a small coal reserve along with significant, yet continuously declining natural gas and oil reserves. 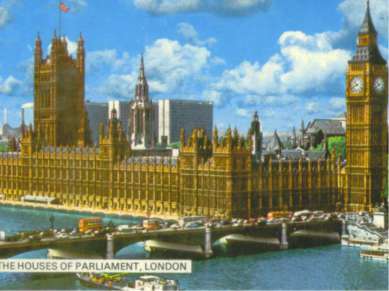 Coal mining was a significant part of the UK economy. 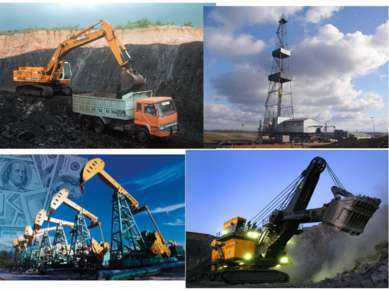 In 2004, total UK coal consumption (including imports) was 61 million tonnes. 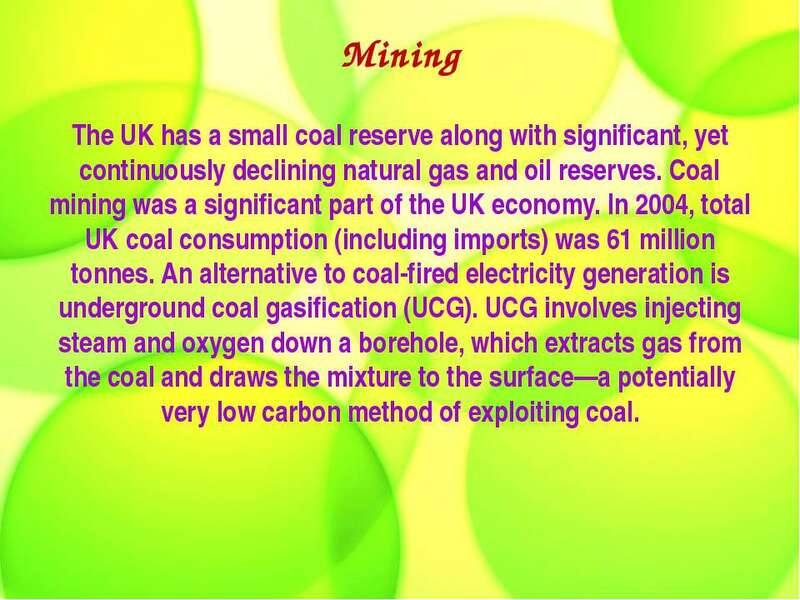 An alternative to coal-fired electricity generation is underground coal gasification (UCG). 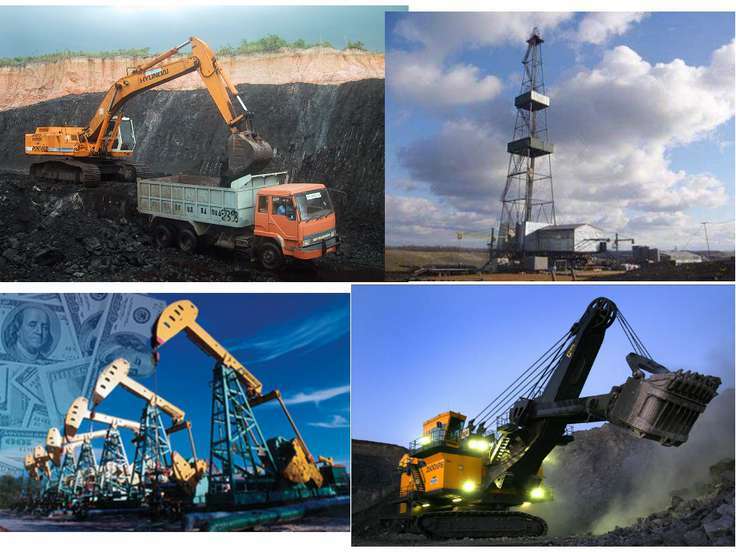 UCG involves injecting steam and oxygen down a borehole, which extracts gas from the coal and draws the mixture to the surface—a potentially very low carbon method of exploiting coal. 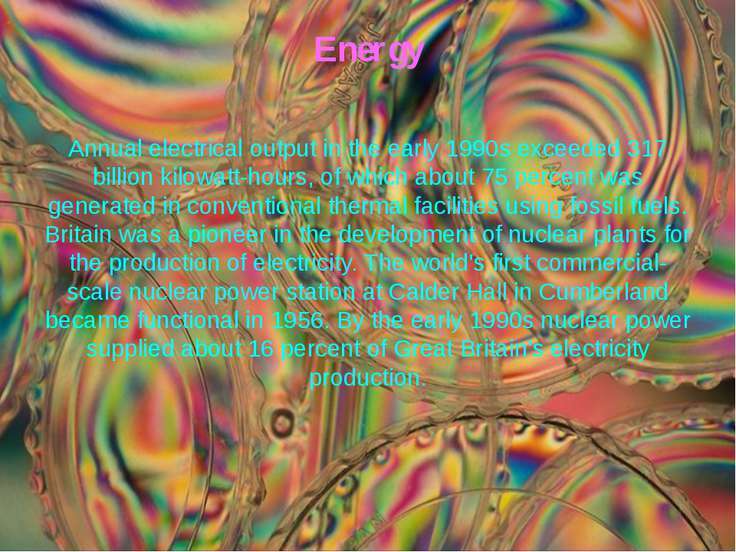 Energy Annual electrical output in the early 1990s exceeded 317 billion kilowatt-hours, of which about 75 percent was generated in conventional thermal facilities using fossil fuels. Britain was a pioneer in the development of nuclear plants for the production of electricity. The world's first commercial-scale nuclear power station at Calder Hall in Cumberland became functional in 1956. By the early 1990s nuclear power supplied about 16 percent of Great Britain's electricity production. 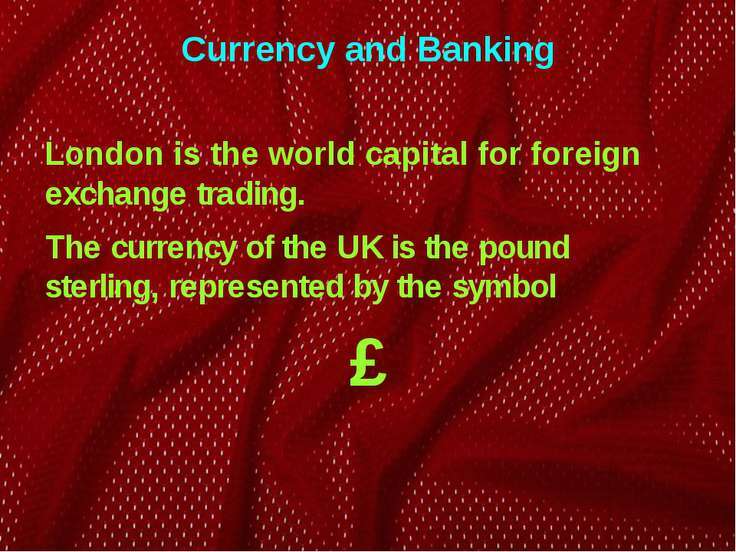 The Bank of England is the central bank, responsible for issuing currency. Banks in Scotland and Northern Ireland retain the right to issue their own notes, subject to retaining enough Bank of England notes in reserve to cover the issue. 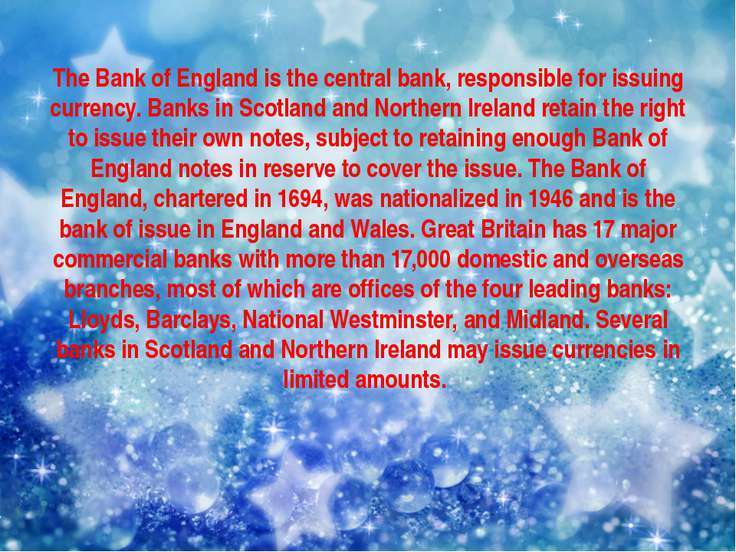 The Bank of England, chartered in 1694, was nationalized in 1946 and is the bank of issue in England and Wales. 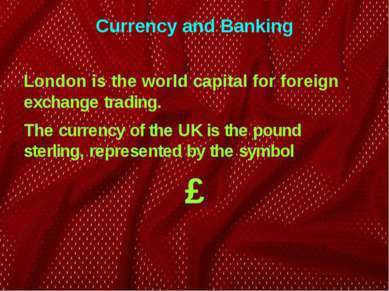 Great Britain has 17 major commercial banks with more than 17,000 domestic and overseas branches, most of which are offices of the four leading banks: Lloyds, Barclays, National Westminster, and Midland. Several banks in Scotland and Northern Ireland may issue currencies in limited amounts. 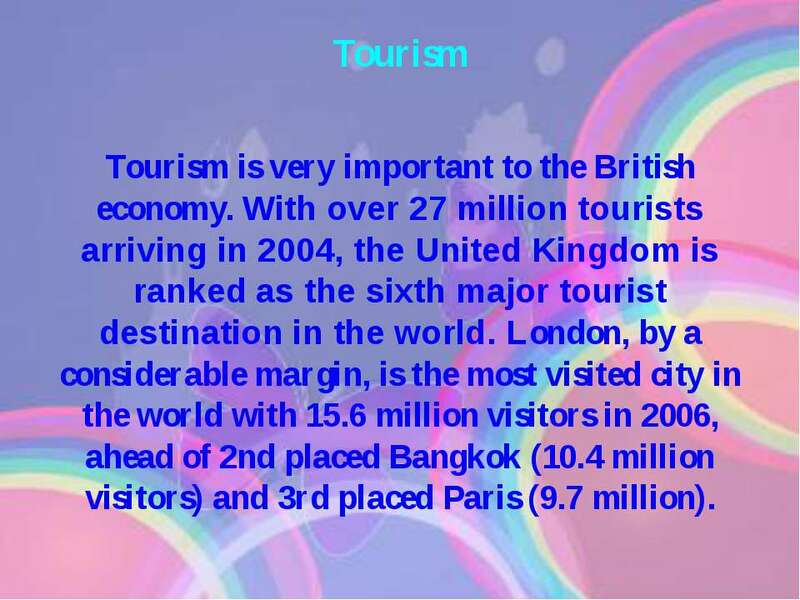 Tourism Tourism is very important to the British economy. With over 27 million tourists arriving in 2004, the United Kingdom is ranked as the sixth major tourist destination in the world. 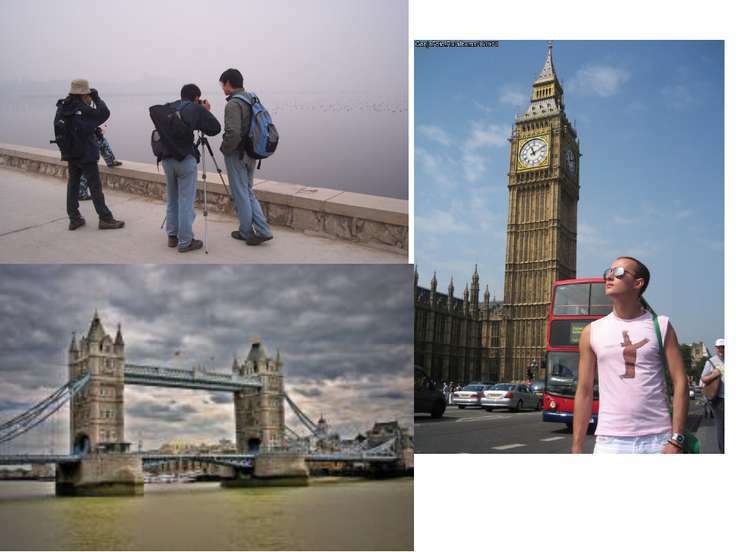 London, by a considerable margin, is the most visited city in the world with 15.6 million visitors in 2006, ahead of 2nd placed Bangkok (10.4 million visitors) and 3rd placed Paris (9.7 million). Communications The Post Office, founded in 1635, maintains about 20,000 branch offices throughout Great Britain and administers a postal savings system. 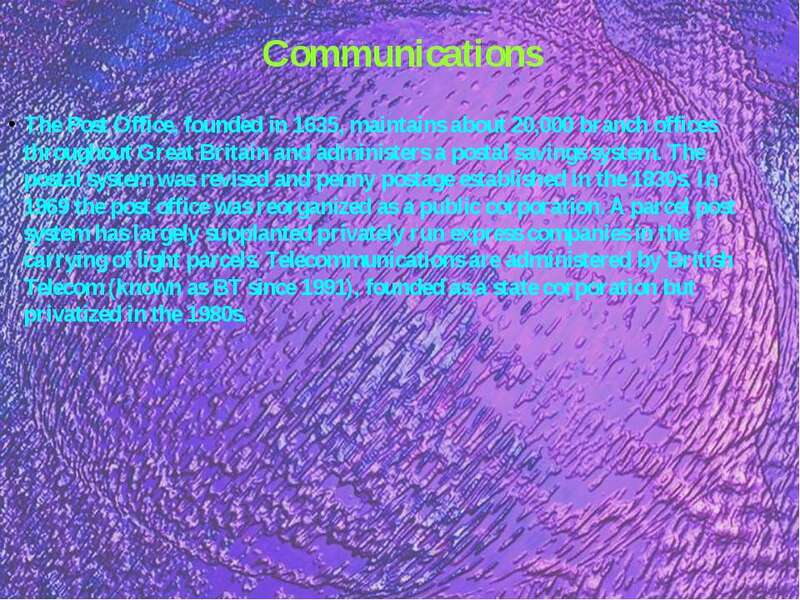 The postal system was revised and penny postage established in the 1830s. In 1969 the post office was reorganized as a public corporation. A parcel post system has largely supplanted privately run express companies in the carrying of light parcels. 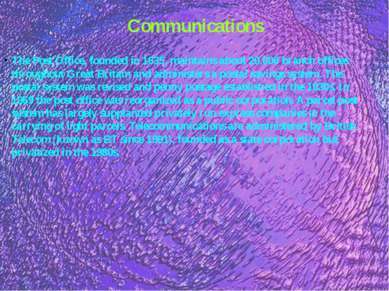 Telecommunications are administered by British Telecom (known as BT since 1991), founded as a state corporation but privatized in the 1980s. 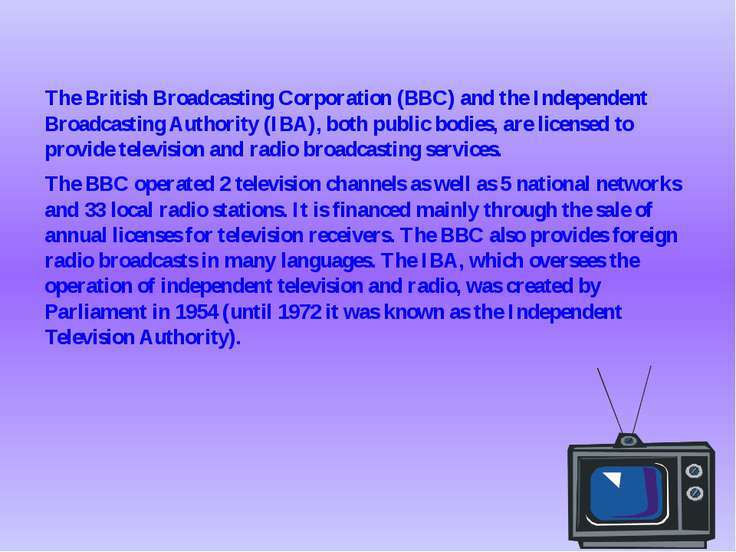 The British Broadcasting Corporation (BBC) and the Independent Broadcasting Authority (IBA), both public bodies, are licensed to provide television and radio broadcasting services. 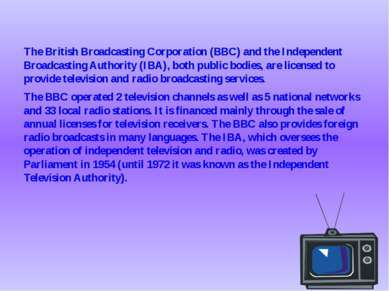 The BBC operated 2 television channels as well as 5 national networks and 33 local radio stations. 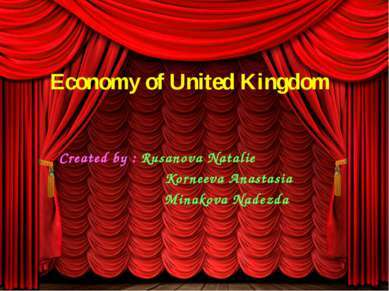 It is financed mainly through the sale of annual licenses for television receivers. The BBC also provides foreign radio broadcasts in many languages. The IBA, which oversees the operation of independent television and radio, was created by Parliament in 1954 (until 1972 it was known as the Independent Television Authority). Service industries The service sector is the dominant sector of the UK economy, a feature normally associated with the economy of a developed country, and makes up about 73% of GDP. This means that the Tertiary sector jobs outnumber the Secondary and Primary sector jobs. 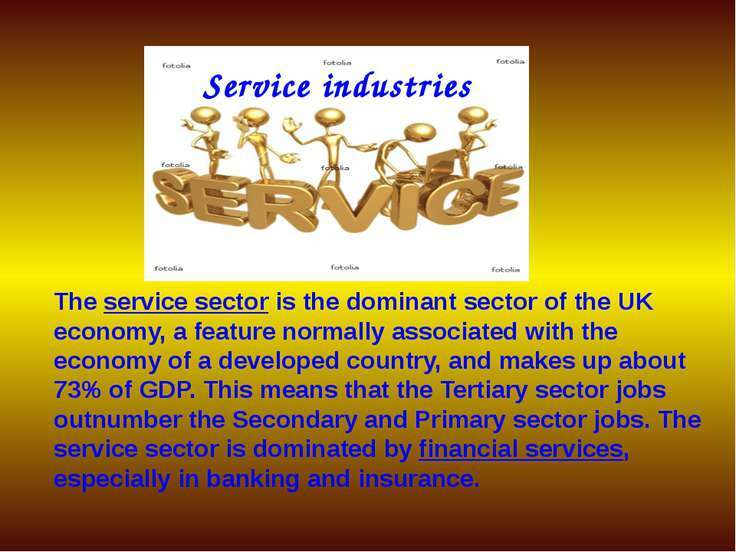 The service sector is dominated by financial services, especially in banking and insurance. London is a major centre for international business and commerce and is the leader of the three "command centres" for the global economy (along with New York City and Tokyo). 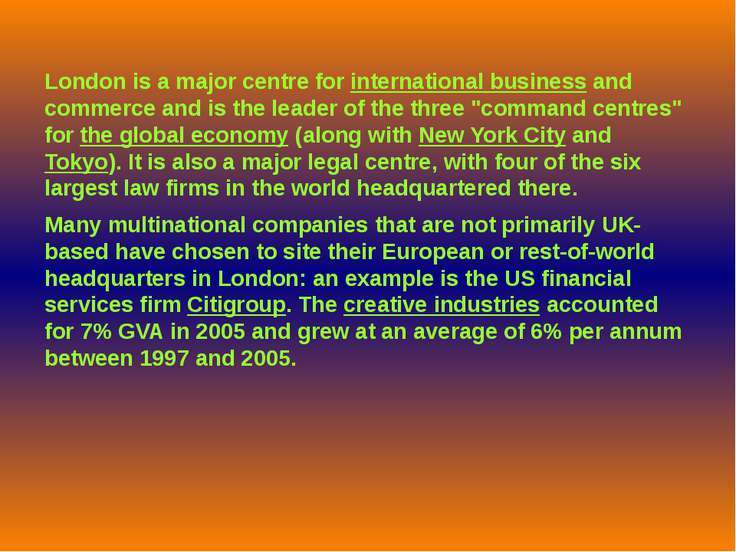 It is also a major legal centre, with four of the six largest law firms in the world headquartered there. 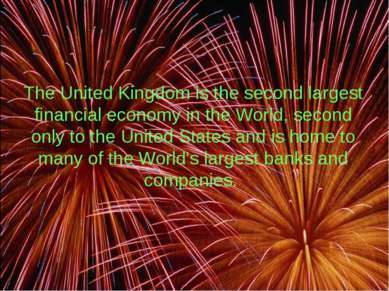 Many multinational companies that are not primarily UK-based have chosen to site their European or rest-of-world headquarters in London: an example is the US financial services firm Citigroup. The creative industries accounted for 7% GVA in 2005 and grew at an average of 6% per annum between 1997 and 2005. 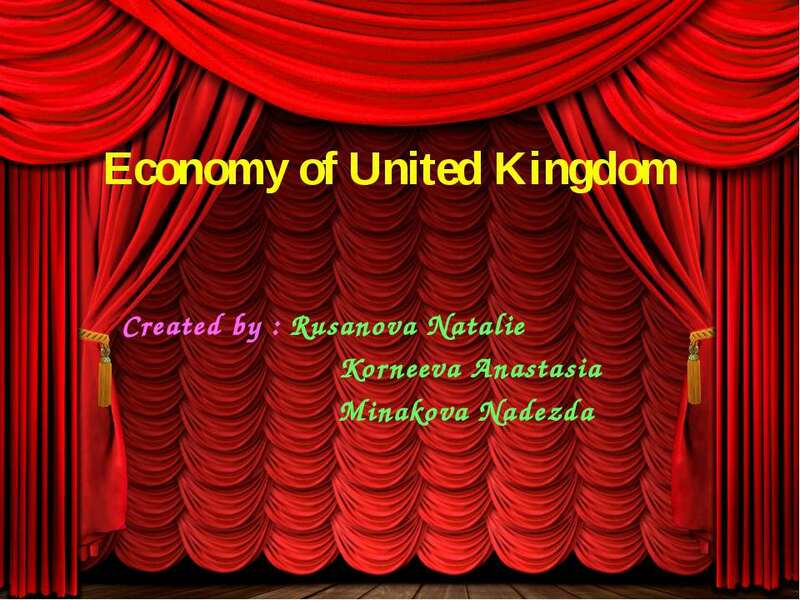 The United Kingdom is a developed country with social welfare infrastructure, thus discussions surrounding poverty tend to be of relative poverty rather than absolute poverty. According to the OECD, the UK is in the lower half of developed country rankings for poverty rates, doing better than Germany, Italy and the US and less well than France, Austria, Hungary, Slovakia and the Scandinavian countries. 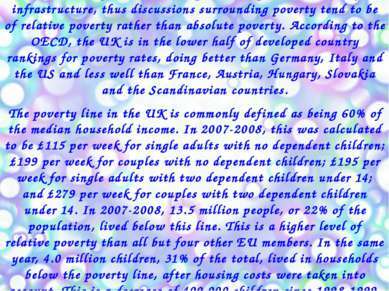 The poverty line in the UK is commonly defined as being 60% of the median household income. 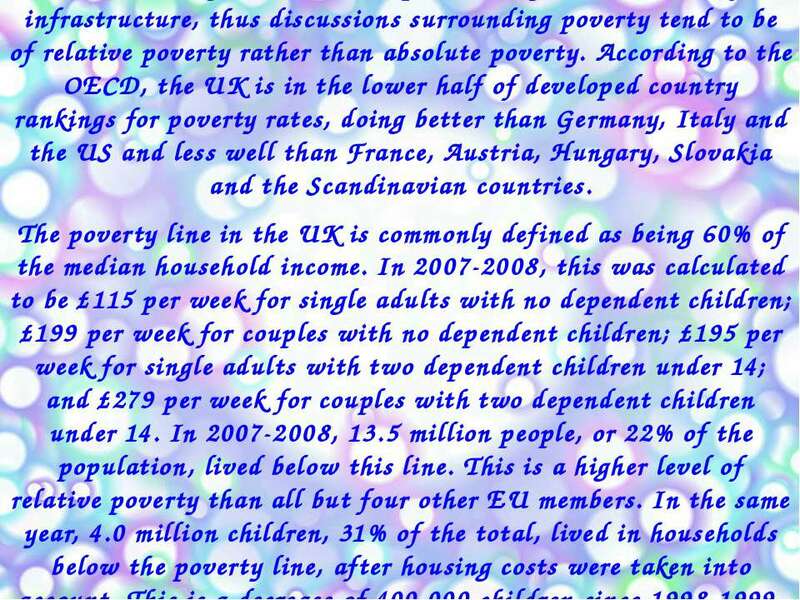 In 2007-2008, this was calculated to be £115 per week for single adults with no dependent children; £199 per week for couples with no dependent children; £195 per week for single adults with two dependent children under 14; and £279 per week for couples with two dependent children under 14. In 2007-2008, 13.5 million people, or 22% of the population, lived below this line. This is a higher level of relative poverty than all but four other EU members. In the same year, 4.0 million children, 31% of the total, lived in households below the poverty line, after housing costs were taken into account. This is a decrease of 400,000 children since 1998-1999.